The Irishman range of Irish whiskies has been given an updated, more premium, brand identity and pack design. London and New York based brand development consultancy The Futures Company took the brand onto the streets in New York, Hamburg and Seoul for in-depth reviews and focus groups. From this research, the message of ‘making it personal’ become central to the brand positioning of the The Irishman range of whiskies – The Irishman Founder’s Reserve, The Irishman Single Malt, The Irishman 12 Year Old and The Irishman Cask Strength. The objective, the company explained, was to elevate The Irishman brand identity to compete in design and image with the world’s greatest whiskeys while conveying the ethos of using craft distillation and quality ingredients. The refreshed label and brand identity adhere to the essence of the personal nature of the brand offered by founders Bernard and Rosemary Walsh. The redrawn logo and portrait of Bernard Walsh on the label reflect the quality of the brand and show confidence in its future. Pictured left is how the bottles looked prior to the redesign. The Irishman Brand was founded in 1999 by Bernard and Rosemary Walsh in Co. Carlow, the heart of Ireland’s premier barley growing region. In 2006 the Walsh’s launched The Irishman Whiskey range and each year they try to add at least one new expression, typically a select Cask Strength bottling. In 2012 the company released its first 12 Year Old Single Malt. The Irishman brands have gained ready acceptance in over 36 countries spanning four continents. 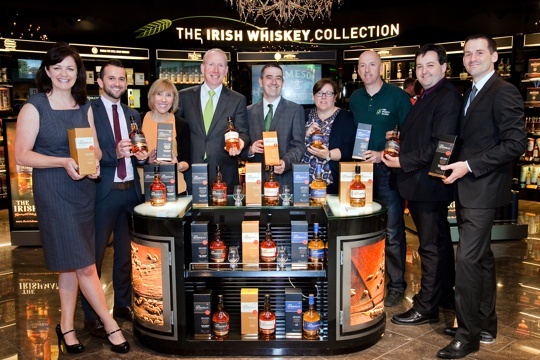 The Whiskey Collection at Dublin and Cork airports is launching the new look of The Irishman Brands whiskey range. where it will be available exclusively for the months of July and August.